"Invites the readers to hop on the board and catch the (sound) wave." 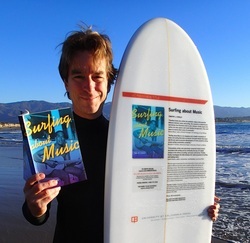 ﻿As the first major book examining the connection between music and surfing, Surfing About Music explores the relationship between surfers and the music they produce. Tim Cooley utilizes his knowledge as a practicing musician and avid surfer to consider the musical practices of surfers throughout the world. Based on real-life stories of surfers and musicians from diverse backgrounds, Cooley paints a compelling analysis on the trends of surfing and music.